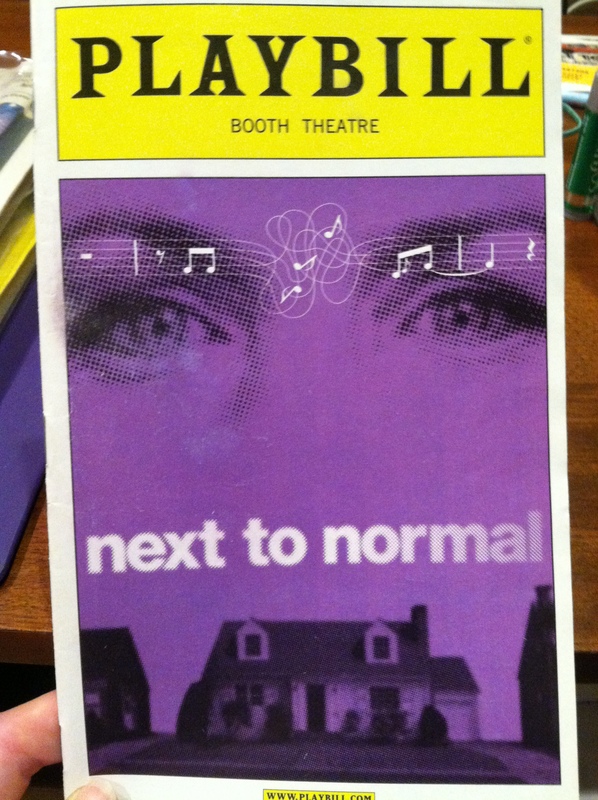 Just before the 2009 Tony Awards, I started hearing about this new musical, Next to Normal. I knew that Alice Ripley was the frontrunner for the Tony Award, but aside from the nominations list, I didn’t know much about the show. After seeing the 2009 Tony Awards, I downloaded the soundtrack and listened to it for months with no expectations of ever seeing Next to Normal on-stage. Enter Big Important Internship in New York City! If you read my previous Playbill Throwback on Mary Poppins, then you already know how little time I had to move out to New York City, find an apartment, and get a feel for the city before the internship started. My first internship orientation training day was scheduled for Friday, and I couldn’t think of a better way to celebrate the first day of the rest of my life than a musical about clinical depression. Next to Normal is about Diana Goodman, a wife and mother with bipolar II disorder, and her family who is struggling to hold it together and find normalcy. Her husband Dan loves her dearly, but Diana’s endless treatments, changing medication, and delusional episodes are wearing on him. Diana also believes that her son Gabe, who died when he was only a baby, is alive and has grown into a handsome teenager. Meanwhile, their daughter Natalie is stressing herself out in school, hoping to get into Yale and move far away from both of her parents, but she is also falling for Henry, a good-hearted high school stoner. I didn’t know it yet, but Next to Normal had a lot (and I mean a LOT) of helpful lessons which would serve me over the next few months. Before I get to those lessons, though, let’s take a look at the cast! Principal actors who were not members of the original cast are in bold. Whoa, that’s right! First time I’ve seen a show with the entire original Broadway cast! I ended up seeing Next to Normal three times, twice in October and once in November. I had family and the fiancé come out to New York to visit, which was part of the reason why I saw it two more times. Honestly, I think I would have seen Next to Normal two more times anyway, regardless of people visiting. You see, the Big Important Internship wasn’t going as well as I had hoped. I’m not going to go into detail about the circumstances or where I was interning. I won’t even say that it was a bad experience because I had some really good memories from the internship. To sum it up, I realized early on that this department wasn’t the right place for me, and unfortunately, my supervisor and I had gotten off on the wrong foot. Making matters worse, I was still having a hard time navigating the New York City subway system, and this is a very big problem when most of my duties are delivering and picking up money/props/craft services. I was trying my best, but deep down, I didn’t feel good about the internship or myself. It might seem strange that I would take comfort in a show about mental illness and the breakdown of a family, but Natalie and Diana’s journeys in the show empowered me and kept me going. Like Natalie, I worked so hard in school to get good grades and take the right extracurriculars, but in the process, I also stressed myself out and wore myself down physically and emotionally. She feels that every minute of her life is a test, and I understood why she turns to partying and pills after messing up her big piano recital. Seeing her go through all of that and still come out at the end of the show intact, I felt like I could face whatever the future held for me, whether my internship was a success or a failure. Similarly, Diana’s journey is a difficult one. By the end of the show, her family as she knew it is no more, and she still has to face her disease every day. Still, she has the courage to make a change in her life and do what she knows is right, even when it means letting Dan go. I saw Diana’s strength as well as her significant flaws, and I gave myself permission to be kinder to myself and allow myself to make mistakes while still striving for better. “The Secrets to Stargazing,” an article about how and where to meet Broadway celebrities (Easy answer, go to the stage door! ), Jude Law in Hamlet, a profile of Michael McKean, John Stamos in Roundabout Theatre’s revival of Bye Bye Birdie, Carrie Fisher’s one-woman show Wishful Drinking (coming soon to Playbill Throwback! ), and Thomas Kail’s new show Broke-ology.